Zo adapted this shot from one she heard a bar in Austin serves. She changed out the alcohols and made a great chili and salt crust added to the rim of the shot! It is great going down and about 5 seconds later you feel a little heat from the pepper. Enjoy! Mix together the chili and kosher salt in a small dish. Take a large jalapeno and carefully trim off the top leaving as much pepper as possible. Using a fillet knife carefully remove all seeds and membrane from the jalapeno. Squeeze fresh lime juice into a small dish and moisten the top of the jalapeno in the lime juice. 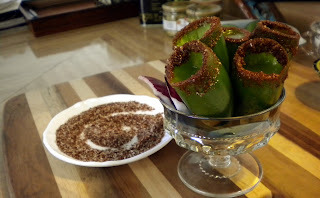 Dip the top of the jalpeno into the chili and salt mixture and your shot glass is ready. Fill your jalapeno shot glass with 1/2 oz of each tequila, freshly squeezed lime juice and orange liquor, let sit for 1-2 minutes and then prepare for one of the best shots you will ever have!